I find myself writing about Hippo’s again or as they were known as Sea Horses or Sea Cows however this time I am aiming further north from Durban’s Riverhorse Park to a World Heritage Site known as iSimangaliso Wetland Park. I find myself writing about Hippo’s again or as they were known as Sea Horses or Sea Cows however this time I am aiming further north from Durban’s Riverhorse Park to a World Heritage Site known as iSimangaliso Wetland Park. This Park was also the first proclaimed UNESCO heritage for its abundance of wildlife and untamed natural glory. Within this proclaimed natural wonder lies the town of St Lucia. The Greater St Lucia Wetland Park is situated in the southern end of the Mozambique coastal plain near the towns of St Lucia, Mtubatuba, Hluhluwe, Mkuze, Mbaswana and Manguzi. This is a transitional zone in terms of fauna and flora between the temperate forms of the south and the tropical forms in the north and many species are endemic to this coastal plain. The protected area is home to the largest population of hippopotamus and approximately 1,000 crocodiles as well as a wealth of plant and animal life. Of great interest is the staggering number of birds to be found in the St Lucia Wetlands. Over 500 different species of birds are resident or pass through the wetland system annually and comprise of marine, wetland and forest birds. The park has one of the most diverse variety of frogs and their choruses can often be heard at night and on dull rainy days. The highly endangered gaboon adder and a large variety of other snake species reside in this subtropical coastal dune forest. Other reptiles, such as the marine turtles, the Leather Back Turtles and Logger head Turtles utilise the protective beaches to breed in. St Lucia is a tourist haven as it lies central to many popular tourist attractions in the Zululand region which include amongst others the Umfolozi and Hluhluwe Game Parks. Central to the town of St Lucia is a variety of accommodation choices, restaurants and shops as well as a local craft and produce market. Visitors to this town are regularly enthralled by the appearance of Hippo’s roaming the streets at night. Considering that Hippo’s hold a reputation for its rather fierce and fast temper and stride it certainly keeps tourists on the edge of that real nature experience. The estuary is a fisherman’s (or woman’s) paradise but do be assured as this is a real untamed experience promising the most thrilling vacation ever. My family and I were afforded the great privilege of spending a weekend in this natural paradise thanks to generous hospitality of the owners of the Hippo Hideaway. 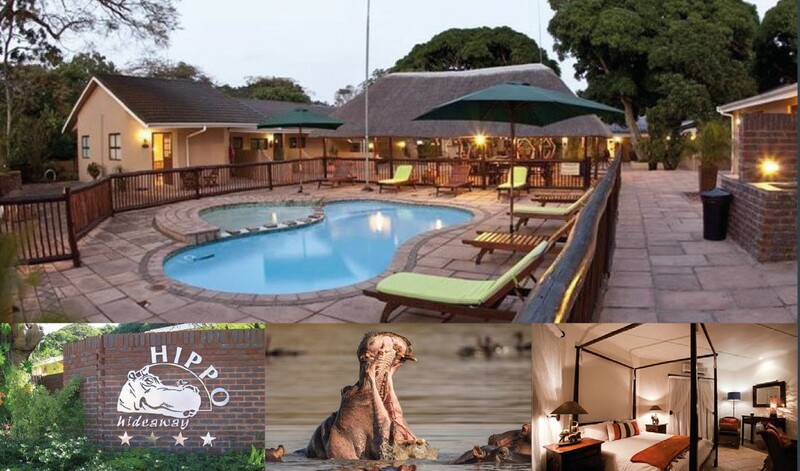 The Hippo Hideaway is a luxurious self-catering establishment most favourably situated in the heart of the town’s centre where all the amenities are a short stroll on either side. This 4000 m2 property lies along the banks of the estuary and boasts 21 superbly equipped units ranging from two to four sleepers. We were warmly welcomed by the Resort’s hostess and found ourselves at home in no time. The children were obviously delighted by the wifi onsite as my wife and I enjoyed the sublime serenity and abundant birdlife frolicking in the warm late afternoon sun. As most South African’s would we instinctively prepared ourselves for an evening braai (BBQ) with a quick and convenient visit to the supermarket directly across the street. The night ambiance in the resort is tranquil with soft lighting all around and a clear accentuation of the central boma. The boma offers guests plenty of seating space and even a few well positioned hammocks ideal for a catnap or a good book. The pool is a generous size and will definitely come in handy during those scorching Zululand summers even though my kids didn’t hesitate having a winter dip. These accommodation units are incredibly well equipped and kudos to the owners who really considered every possible need for the guests. The crockery and glassware are all branded with a signatory ‘Hippp Hideaway’ insignia which is a great brand awareness strategy. The kitchens are modern and equipped with all the conveniences you would expect from a 4 star rated resort with many extras. The bedrooms are stylishly furnished and ensure a comfortable night’s rest. Most of units are located at the upper end of the resort, with the boma area as the central focal point, with the larger family units positioned at a lower level along the estuary. The resort is ideally equipped for tour groups with accommodation for well over 40 patrons at a time. The property layout is well thought out as it provides ample onsite parking for cars and busses alike. Sectional plans have been drawn up for the property which lends itself well for a sectional ownership development or perhaps a retirement retreat. Regretfully time doesn’t stand still and our weekend getaway came to an end but we were all well rested and felt completely spoilt thanks to the magnificent Hippo Hideaway Resort. The Hippo Hideaway will be sold at Auction by In2assets on 25 July 2017 and in my own experience I know that the new owner will buy a piece of African paradise.